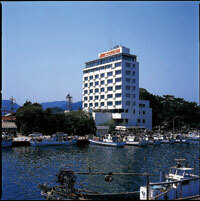 Oki Plaza Hotel is located in front of fishing boat port immediately, and offers the splendid view of Port of Saigo. Please enjoy the sight of coming and going of boats from guest room. A light of fishing boat and the lighthouse are impressive at night.